All of the lenders in our network are required to adhere to the regulations that govern short term loans in each state. Some of the things that individual states control include the maximum loan amounts, the amount of fees or interest that a lender can charge, the number of loans that can be outstanding at any given time, and even the amount that lenders are allowed to charge for nonsufficient funds. If you would like more information, please see the table below for the regulations in your state. Your state’s Attorney General’s office can also provide you with more detailed information. This table lists the state, the maximum loan amount and the regulations in that state. Finance charges may not exceed $10 and interest may not exceed 10%. Late charges cannot exceed 15% of the loan amount. Finance charges may not exceed 10%. Interest may not exceed 15%. The loan maximum is $500 or 25% of the borrower’s gross income, whichever is less. Interest may not exceed 15.5%. Minimum loan amount is $50. Lenders may charge no more than 15% interest on the first $250, 13% on amounts between $251 and $400, an 10% on amounts between $401 and $550. Lenders may not charge more than 15% on the first $100 of the loan or more than 10% on each consecutive $100. Lenders may not charge more than 15% interest and an additional 3% per month after the loan maturity date. No additional charges are allowed with the exception of returned check fees. Consumers may not have more than two outstanding short term loans at any given time, and the total of both loans cannot exceed $500. Interest may not exceed 16.75%. Service charges cannot go beyond 15% of the first $100, 14% of the second $100, 13% of the third $100, 12% of the fourth $100 and 11% of the fifth and sixth $100. Lenders may impose a $5.50 charge of loans up to and including $50. 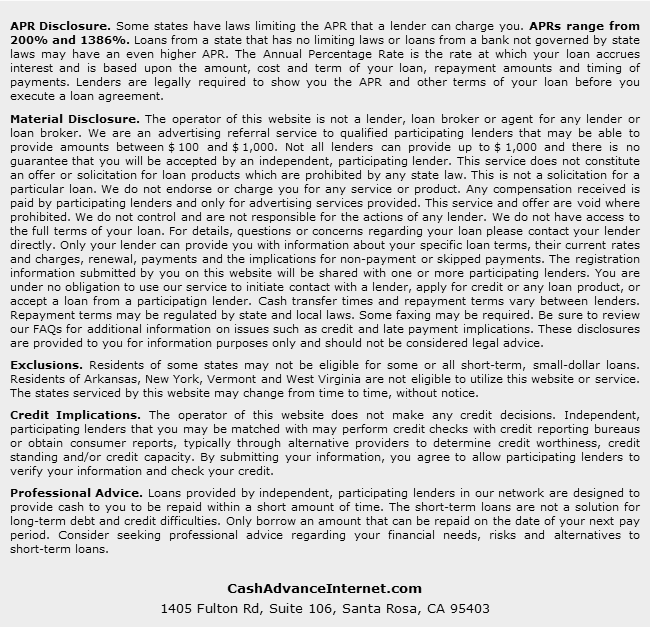 They may charge 10% of the loan amount as well as a $5 service fee on amounts between $51 and $100. They may charge 7% and a $5 service fee on amounts between $101 and $250. They may charge 6% and a $5 service fee on amounts between $251 and $300. Lenders may not charge more than 2.75% as late fees. Fees may not exceed 3% of the amount of the loan or $5, whichever is greater. Lenders may not charge more than 18% of the loan amount as interest. Collective fees and interest may not exceed 75% of the loan amount at any time. Loans have a $50 minimum cost and a $300 maximum cost. Interest and fees may not exceed 36% per annum including fees for nonsufficient funds. Fees may not exceed 6% and interest may not exceed 36% per year. Loan amount plus fees may not exceed 25% of the borrower’s gross monthly income. Interest cannot exceed 15.59% and processing fees or new loans cannot exceed $50. Fees for insufficient funds cannot exceed $15. Interest may not exceed 28%. Lenders may not charge more than 15% for the first $300 of any loan or more than 10% for loans greater than $300. Lenders cannot charge more than 36% interest. Service charges cannot exceed 10% of the loan or $30, whichever is less. Lenders may not charge more than 10% interest. Lenders may not charge more than 15% interest. Lenders cannot charge more than 20% as interest and verification fees must not exceed $5. Loans cannot exceed 30% of the borrower’s gross monthly income. Interest charges cannot exceed 15% on loans of up to $500. Interest charges cannot exceed 10% on loan amounts greater than $500. There are no regulations that control interest, but lenders may not penalize borrowers for repaying their debts early. Finance charges shall not exceed either $30 or 20% a month. The following states do not regulate short term loans: Connecticut, Massachusetts, New York, Maryland, New Jersey, Pennsylvania, West Virginia and Vermont. Short term loans are prohibited in Georgia and West Virginia. Arizona and North Carolina permitted pre-existing short term loaning statutes to sunset.